One of the fondest memories I have of my mom is that she always made such a fuss about anything related to High Tea. For my 6th or 7th birthday, she threw me a “Little Ladies Tea Party”. All the guests were told by fancy invitation to wear their mother’s hats, pearls and high heels. She transformed our living room into a stylish “Conservatory” fit for a Princess, complete with little tables seating 4 girls each. She took out her expensive china left to her by her Grandmother and made us delicious Cucumber & Cream cheese sandwiches, miniature Quiche Lorraine and dainty cupcakes. I was in heaven. So it’s safe to say that the High Tea tradition is a very special one to me. My favourite High Tea spread, to this day is the one at Sun City at the Palace of the Lost City. The food is impeccable, the tea is delicious and the venue is breath-taking. If you are EVER in South Africa, you have to visit the Palace, it is absolutely marvellous. But as I live quite a few km’s away from Sun City, I try to bring some of that High Tea glamour into my own kitchen. Of course I don’t prepare the sandwiches, quiches, tarts and cakes that the wonderful chefs at the Palace do, but I try to bake something every week to add some delicious-ness to our home. This cake is so extremely easy and really takes almost no effort, which is why I feel quite guilty giving you the recipe when I’ve been hammering on about fabulous High Tea’s. But I think it’s the simplicity and the real punch of flavour that gets to me with this one. I have a thing for fresh Lemons, it is the one thing my kitchen is never without and I use it in literally EVERYTHING. Even if it is just one drop of the juice. And using lemons in 3 different ways in this recipe makes this cake what it is. Delicious, moist and something I know my mom would’ve absolutely adored. Pre-heat the oven to 180°c and grease a standard loaf tin. For the cake, combine all the ingredients in a large mixing bowl and mix until everything is well combined and the mixture is thick and creamy. Transfer the batter to the cake tin and smooth out the top. Bake the cake for 20-25 minutes until a skewer inserted comes out clean. Remove from the oven and allow to cool for 5 minutes in the tin before removing it and allowing to cool completely on a wire rack. Meanwhile, make the lemon syrup by bringing the ingredients to the boil in a small saucepan. With a skewer, poke holes into the cake and carefully spoon the hot syrup over the cake, allow to cool down completely. 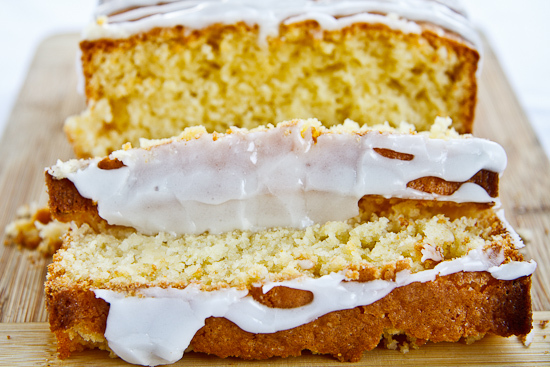 Make the lemon glaze by whisking the lemon juice teaspoon by teaspoon into the icing sugar. You want the glaze to be quite thick. When the cake has cooled completely, drizzle over the lemon glaze. I have been craving a lemon & poppy loaf for ages now and this recipe just made me decide to go for it. 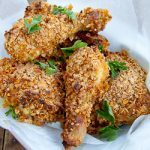 Think I could just add a tbsp or 2 of poppy seeds to this recipe? Poppy seeds would be perfect in this cake! I have no idea what the quantity of ingredients are – need cups, tblsp, etc. This recipe looks great – definitely one to try. As a novie baker, one thing that confuses me (and stops me from baking goodies in a loaf tin), and what size is a standard loaf tin. Every time I go out to buy one, there are a few options. Maybe you can solve this for me one and for all. Just stumbles across your site via Facebook – looks great. 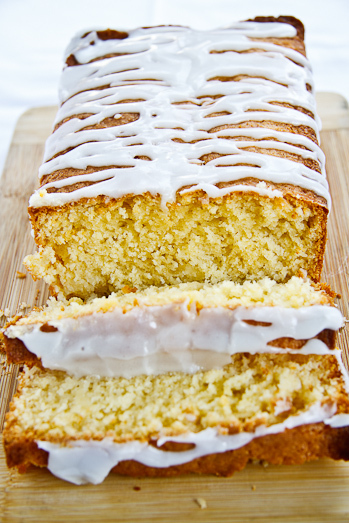 Do you think the lemon cake recipe would work with Meyer lemons? My family loves Meyer lemons big time. Every year we host a potluck dinner where everyone is asked to bring a Meyer lemon dish, from entrees to desserts. Everything has to have Meyer lemons in it. I’m looking for creative Meyer lemon recipes and I was thinking that a Meyer lemon version of your excellent luscious lemon cake recipe might be a big hit. PS. Meyer Lemons are like love. Sometimes hard to find, but well worth the wait. They’re nearing the end of the season which usually ends in March, so they’ll soon be hard to find.